King, Betty Nygaard. "Ian Tyson ". The Canadian Encyclopedia, 04 March 2015, Historica Canada. https://www.thecanadianencyclopedia.ca/en/article/ian-tyson-emc. Accessed 22 April 2019. As Ian and Sylvia, they performed together 1961-75. Two of Tyson's best-known songs, "Four Strong Winds" and "Someday Soon," date from this period. Ian Tyson, shown here at a concert in Hugh's Room at Toronto, is one of Canada's most enduring artists (photo by George Goodwin). Ian (Dawson) Tyson. Singer, songwriter, guitarist, rancher, b Victoria, BC, 25 Sep 1933; honorary D LITT (Athabaska) 1993, honorary LLD (Calgary) 2001, honorary D LITT (Thompson Rivers) 2007. 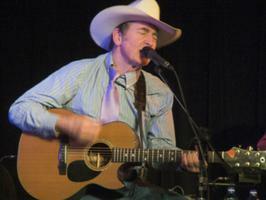 A rodeo rider in his teens and early 20s, Ian Tyson took up the guitar while recovering from injuries sustained in a fall. He made his debut at the Heidelberg Café in Vancouver in 1956 and played with a rock 'n' roll band, the Sensational Stripes. After graduating from the Vancouver School of Art in 1958, Tyson moved to Toronto, where he worked as a commercial artist. There he performed in local clubs and in 1959 began to sing on occasion with Sylvia Fricker. As Ian and Sylvia, they performed together 1961-75. Two of Tyson's best-known songs, "Four Strong Winds" and "Someday Soon," date from this period. (The former song has been covered by such singers as Neil Young and Sarah McLachlan; the latter song, included in 1963 on Ian and Sylvia's LP Northern Journey, became a minor country classic, recorded by Lynn Anderson, Suzy Bogguss, Glen Campbell, Judy Collins, Crystal Gayle, Tanya Tucker, and others.) Concurrently, on his own, Tyson was host for The Ian Tyson Show, seen weekly 1971-5 on CTV, and had country hits in 1974 with "Great Canadian Tour" and "She's My Greatest Blessing" (from Ol' Eon, A & M SP-9017). Following the duo's demise, Tyson spent a brief period in Nashville, then moved to Alberta. He eventually settled on a ranch near Longview, southwest of Calgary, and divided his time between music and the breeding of cutting horses. His second LP, One Jump Ahead of the Devil (Boot BOS-7189), issued in 1979, included the hit "Half a Mile of Hell." His "Moondancer" was popular in 1981. Tyson remained only locally active during this period but served as host in the mid-1980s for CTV Edmonton's Sun Country. His third LP, Old Corrals and Sagebrush (Columbia PCC-80080/Stony Plain SPL-1106), issued in 1983, was the first in a series devoted to the imagery and mythology of cowboy life. It was followed by Ian Tyson (1984, Columbia FC-39362/Stony Plain SPL-1114), Cowboyography (1986, Stony Plain SPL-1102), I Outgrew the Wagon (1988, Stony Plain SPL-1131), and And Stood There Amazed (1990, Stony Plain SPCD-1167). Cowboyography, which reached platinum status in the 1990s, included the hits "Cowboy Pride," "The Gift," and "Fifty Years Ago," and saw Tyson resume a touring itinerary in Canada and the USA with his band, the Chinook Arch Riders. Other popular titles 1987-91 included "Navajo Rug," "Irving Berlin (Is 100 Years Old Today)," "Cowboys Don't Cry," "Adelita Rose," "Casey Tibbs," "Since the Rain," and "Springtime in the Rockies." During this period of what has been called his second career, Tyson continued to concentrate on cowboy themes, eg, in Eighteen Inches of Rain (1994, Stony Plain SPCD-1193). In 1999 Tyson released Lost Herd (Stony Plain SPCD-1255); the album, which injected jazz into western standards and Tyson compositions, explores the loss of societal values. Tyson also released two collections: All the Good'uns (1996, Stony Plain SPCD 1234), and Live at Longview (2002, Stony Plain SPCD 1282). In 2005 Tyson continued to explore cowboy themes on the album Songs from the Gravel Road (Stony Plain SPCD-1305). Tyson pursued his musical and ranching activities throughout the 1990s and after. His performances were usually restricted to western Canada and the western USA, but included a tour of eastern Canada in 1997, and appearances with the Mariposa Folk Festival in 2001 (40 years after his first appearance there), the Calgary Philharmonic Orchestra in 2003, and annually at the Elko Cowboy Poetry Gathering in Nevada. Tyson's concert appearances became less frequent following a vocal injury sustained in 2006. Despite a drastic change to the quality of his voice, which he has described as "gravelly" in comparison to the voice that made him famous, he has continued to attract sell-out crowds to his performances. In 2008 he released another album, entitled Yellowhead to Yellowstone and Other Love Stories (Stony Plain SPCD-1339). Writing in The Canadian, Roy MacGregor once noted, "Tyson's voice works ... like a pull of good whisky; rich and carrying, it edges close to the nasal passage before retreating safely, riding that fine country line that so very few voices find." Tyson received three Big Country awards in 1975 (outstanding performance male country singer, top Canadian country TV show, and, for Ol' Eon, best album) and again in 1988 (male vocalist, artist of the year, and, for Cowboyography, best album). He won the Juno Award as male country singer in 1987. His Canadian Country Music Association (CCMA) Awards include single and album of the year (for "Navajo Rug" and Cowboyography, respectively) in 1987, and male vocalist of the year in 1987 and 1988. Tyson's "Someday Soon" earned ASCAP's 1992 Country Music Award. In 2000 Tyson and Lost Herd were recognized with several awards by the Alberta Recording Industries Association, including best male recording artist and best-selling album. He was inducted into the CCMA Hall of Honour and the Canadian Country Music Hall of Fame in 1989, to the Juno Hall of Fame in 1992, the Canadian Broadcast Hall of Fame in 2000, the Prairie Music Hall of Fame in 2001, and the Mariposa Folk Festival's Hall of Fame in 2006. Tyson was named to the Order of Canada in 1994 and received the Governor General's Performing Arts Award in 2003. In 2010 Ian Tyson was honoured with the Canadian Museum of Civilization's Resonance Award for lifetime contributions to Canadian music. The songwriter-guitarist Clay Tyson is his son. Ian TysonOfficial website for the legendary Canadian country singer Ian Tyson. Ian Tyson and Corb LundCountry artists Ian Tyson and Corb Lund talk about their musical connection in this CBC News clip.